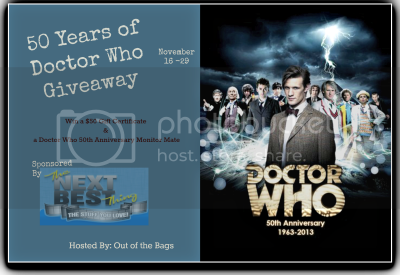 This Crafting Life: 50 Years of Doctor Who Giveaway!! I LOVE DOCTOR WHO! I have watched about half of the series and am also reading some of the books. When I found this giveaway, I knew I was meant to take part in it!!! So here you go, celebrate 50 years of Doctor Who! November 23, 1963 changed everything. Initially started as a family show to fill up the spots between the football results and the evening programing it was new and different. After a run of only 3 years the first Doctor William Hartnell wanted to leave the show the brilliant idea of renewing their doctors was born. In 1989 though after running for 26 years they rested the show until 1996 when they did a made a TV movie featuring the 8th Doctor. It wasn't until 2005 that the Doctor was fully regenerated and it has been nothing but up from there. Doctor Who has a huge following and Whovians every rejoice this year celebrating what Guinness Book of World Records says is the longest running and most successful sci-fi series in the world. Disclosure: This Crafting Life is not responsible for prize fulfillment. My opinions are 100% my own and may differ from your own or even those stated in this post. Out of the Bags and the Next Best Thing are responsible for prize delivery.